This was a sweet little story that took Newbery honors a few years ago. Minli lives in a small, poor village in ancient Asia with her Ma, who has become bitter at their poverty, and Ba (father), who tells stories to lighten it. After a visit by a traveling peddler, Minli sets out to change her family’s fortune—which she does, but not in any way she might expect. This was not a terribly compelling tale. Rather, it’s sweet, unhurried, and magical. I really enjoyed the magic: dragons, goldfish who talk, an evil magistrate whose spirit still haunts the earth, and the Man of the Moon who ties together each human’s destiny with red thread. The sacrificial friendship that evolves between Minli and a flightless dragon is just as magical. But what I loved most was the way Ba’s stories come full circle and wrap around the entire adventure. By the end, all is well but nothing is the same. Minli, her parents, her town, her neighbors, and even the dragon, are all different as a result of Minli’s courage and choices. I’d rate this one an easy 4 star. The adventure really didn’t grip me—it’s pretty tame—but the style is engaging. I was equally intrigued by the Asian setting, having just finished Fire on the Mountain. Coincidental timing. A great read for ages 9-12. It would also be a super accompaniment to a unit on China. If you do pick this one up, be sure to read the afterward that tells how the tale came to be. It made the story even more interesting to me to hear the author explain how she came to embrace her own Asian background. 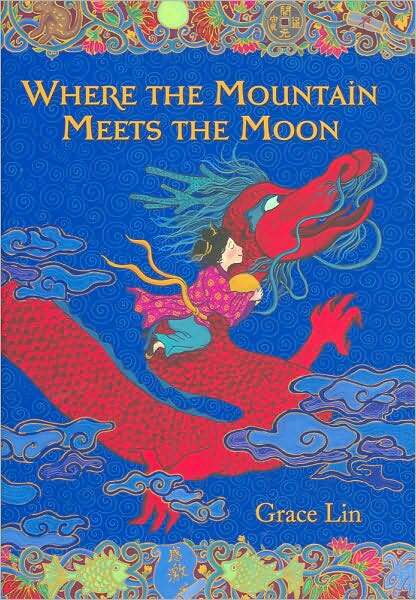 Grab Where the Mountain Meets the Moon on Amazon. I love that title. The story sounds like a good read-aloud. Thanks for featuring a book I hope to read in the future. My daughter read this book for a school assignment, and it’s been on my to-read list for a while. I agree, sometimes the story behind the story is even more fascinating than the story itself. I read this book a few years ago and really loved it. You are right, the story is a bit slow, but sometimes you’re in the mood for something more thoughtful. The cover is gorgeous though! It gives you something to chew on rather than leaving you breathless. Not familiar with this book. Honest review. And, you finished Fire on the Mountain??? I know it will be a while before its release, but that’s good news. Lol, sorry, Pat. This is a case of a spring review getting pushed back multiple times. When I read this over spring break I had just finished Fire (which you recently read). 🙂 Book three, Tears of the Mountain, has only 5,000 words done and was set aside to finish my first Ella Wood book (Candle Star spinoff). And I’m only 15,000 words into that. Summer is busy. That’s the second time tonight I’ve made errors in my comments on posts. :( I responded without thinking the title through. Look forward to Ella Wood. I know the next book is Tears of the Mountain. And, I am just to eager to read it. Have treated myself to rereading the first three books of the Giver series. Can’t wait to see the movie, but see that there will be some changes in the screenplay. They’ve said Lowry has been wonderful to work with. It’s very distinctive, isn’t it?